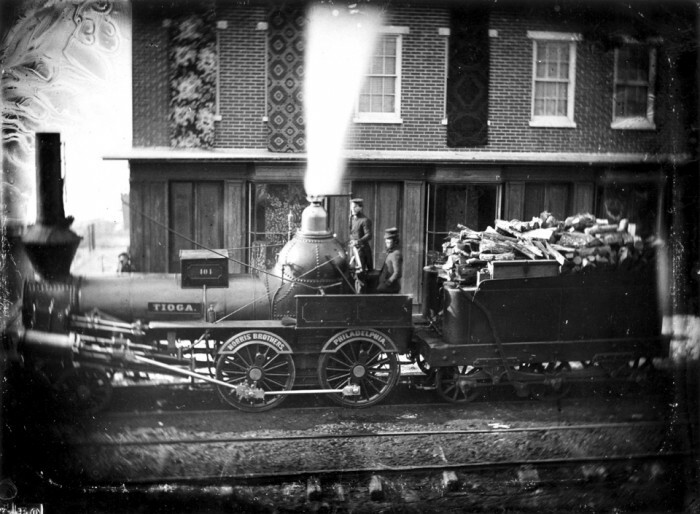 Cameras were slower to become accessible to the common man than railroads, though. The technology used in the mid-19th century was large and expensive, and developing the film required quite a bit of time and effort. Taking photographs outside of a studio was too difficult and costly to create many hobby photographers at all, let alone amateurs who specialized in taking pictures of railroad equipment. 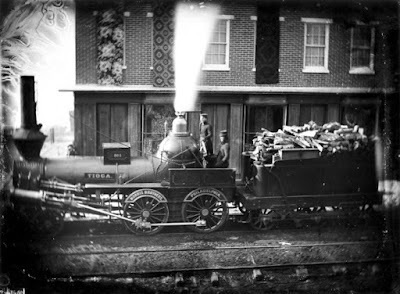 Daguerreotype of an early Philadelphia & Columbia locomotive dating to the 1840s. Outside of historically significant moments, such as the ceremony marking the completion of the Transcontinental Railroad and President Lincoln's funeral train, photographs of railroad equipment remained relatively rare in the early to mid 19th century. One of the earliest applications for which locomotives and railroad equipment were photographed in large numbers was roster shots commissioned by locomotive manufacturers to include in product catalogs. These shots were usually limited to simple profile shots, but were much more detailed than the engravings or drawings used in catalogs produced in the 1830s and 40s. 19th-century pictures depicting the various aspects of the railroad infrastructure itself-- stations, rolling stock, roundhouses and the people that worked among them--remained relatively rare. The nature of photography began to change around the time of the American Civil War. The conflict was not the first war to be documented in film, but the quality and variety of photographs taken by the photographers in the field provided the most comprehensive documentation of any war up to that time. The Civil War was also one of the first conflict in which the use, and destruction of, railroads networks played a roll each the respective faction's strategies. Because of this, Civil War photography presented one of the first opportunities to document the entire infrastructure. 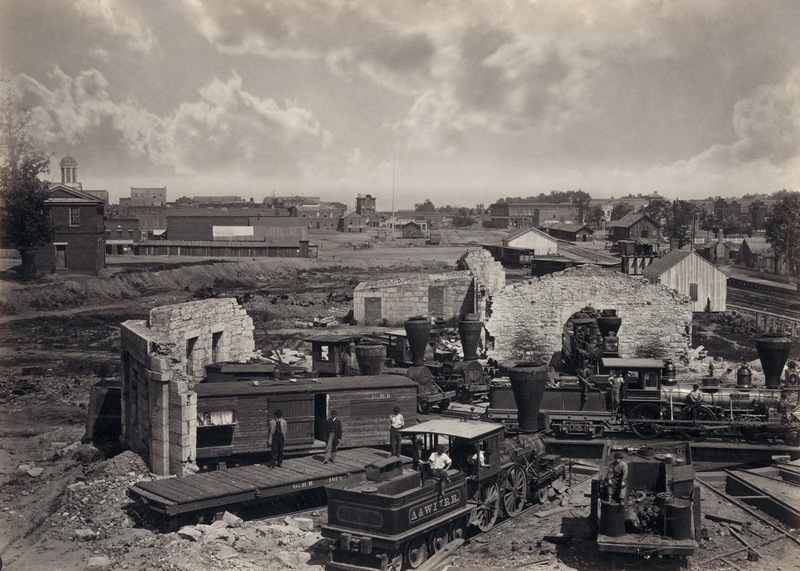 Wreckage of an Atalanta roundhouse bombed during the Civil War, photographed by George Bernard. As the nineteenth century came to a close, camera and film both continued to improve in quality and in ease of use. Equipment increasingly found its way into the average citizen’s hands, and technological advances made it more feasible to capture subjects while they were in motion--in other words, trains no longer had to be photographed while at a standstill. 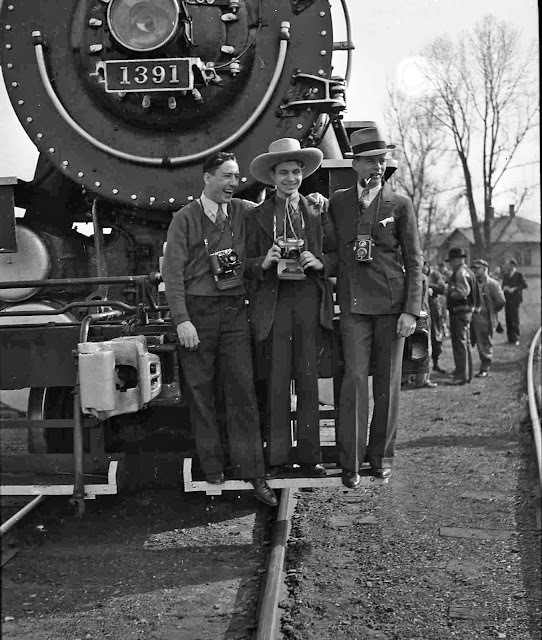 By the 1930s, railroad photography began to coalesce as a form of art in and of itself. The lion’s share of credit for this is due to Luscious Beebe, as notable at the time for his flamboyant personality as for any of his writing and photography. 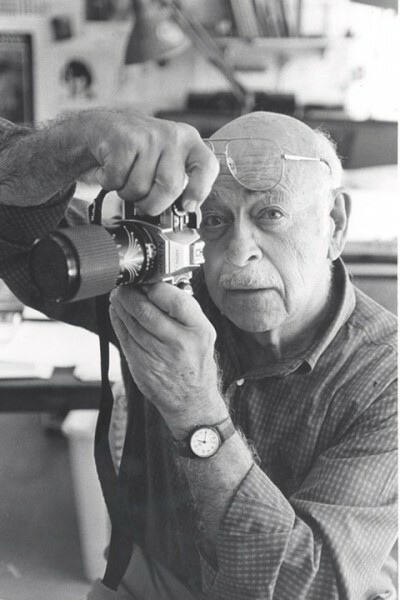 He and his longtime partner Charles Clegg were among the first to appreciate that people outside of the railroad industry might appreciate images and anecdotes documenting the network that linked their cities and carried their goods to market. Beebe’s many books on the subject of railroading form a comprehensive survey of the many different American railroads operating at the time. 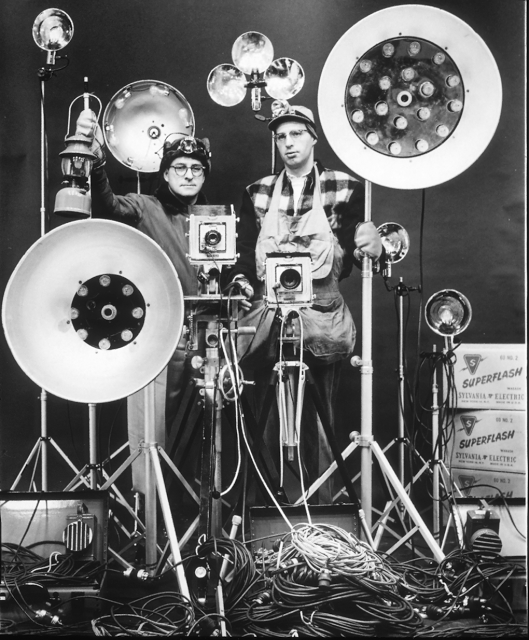 Link posing with his custom-built flash equipment. Lastly--for the sake of conciseness of this article, anyway-- there was O. Winston Link. Claiming the territory of the late-to-dieselize Norfolk & Western as his own, Link’s meticulously composed black-and-white photographs provided visually arresting portraits from the midst of the transition. Famously adverse to daytime photography because he "could not move the sun," Link pioneered the technical aspects of night photography. The results did much to show that taking pictures of trains could be an artistic endeavor, not just a practical one. During these same decades, a number of railroad industry magazines such as Railway Age, Model Railroader, Trains Magazine, and Railroad Magazine, now published as Railfan & Railroad (Full disclosure: I've written for the last two) found their feet and fanned the public appetite for good train images. The idea of special charters specifically to provide train photographers a change to compose their pictures also began to catch in the 1930s. All of these factors combined to make railroading in the early 20th century abundantly documented Railroad historians are fortunate in that another significant improvement in photographic technology to become available to the public: Color film. Camera and film manufacturers’ attempts to produce color film go back almost as far as the invention of the camera itself, but products that were practical to use and produced satisfactory results were elusive until the introduction of Kodachrome in the 1930s. Several decades elapsed before the price range came down enough to be commonly used by amateur photographers, but by the time the diesel era got into full swing in the 1960s. Onlookers watch the 3985 on excursion. Author's collection. It was fortunate timing. Few railroads in the United States ventured beyond mighty but monotonous shades of black and grey for their last generations of steam locomotives. The fleets of diesel locomotives that replaced them brought a blossoming of colors to the tracks. Specific shades of color became instant identifiers of which railroad a locomotive belonged to, far more obvious ones than the nuanced technological differences that set apart steam locomotives operated by different companies. Some paint schemes, like the Santa Fe’s brilliant Super Chief colors and the Chessie’s affable freight colors, took on a mythos all of their own. The next big change arrived in the memory of everyone reading this post: Digital cameras and photography arrived in the 1990s, and took on a quality comparable to film cameras in the mid 2000s. Digital photography soon became preferred both because the cost of purchasing and developing film was eliminated, and because the photographs could be shared to web sites and other media outlets almost effortlessly. The irony of the arrival of digital photography was that it caught on right in the aftermath of the 9/11 attacks. Railfans, and anyone else who made a hobby of studying vital aspects of the nation’s infrastructure, fell under suspicion and sometimes found themselves answering to law enforcement. An aging BNSF locomotives move past a grain tower in Saginaw, Texas. Author's collection. This was not the first time that railfans had to justify their hobby. During WWII, there was similar concern that railroads might be sabotaged, and the Federal government asked private citizens to halt photography of trains during WWII as part of more generalized precautions. For many photographers, the attitude represented an untenable curtailing of their rights, especially as legal settlements more favorable to injured parties led railroads to take a harder stance against trespassers on or near railroad property. Alienating railfans was counterproductive to national security, many argued: Most were familiar enough with train operations to report problems on the network and could serve as unofficial but valuable guardians of the network. That brings us up to the present and, as best I can tell, it's a good time to be involved in the hobby. Recent years have seen the suspicion against railfans lessen somewhat, and railfans now tend to be more self-policing about staying off of railroad property. 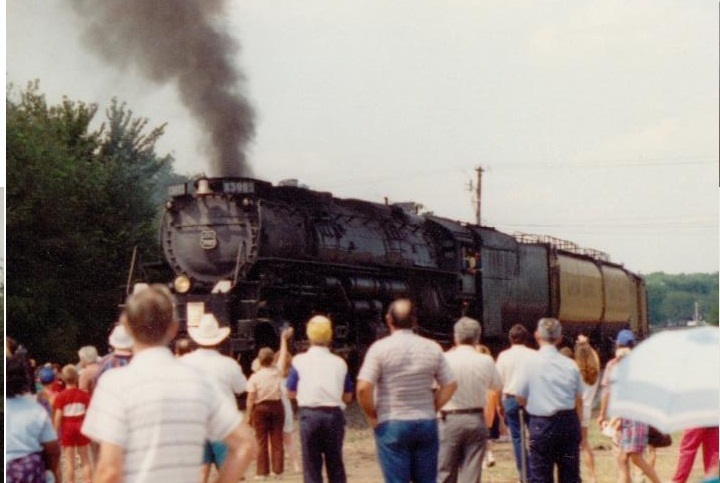 Interest in preservation and restoration projects is riding a high, and the heritage unit programs introduced by a number of Class I railroads memorialize history and provide captivating subjects at the same time. Combine this with turmoil in the energy industry throwing a kink in normal railroad operations, and newer technologies like Tier 4 and LNG locomotives changing what we see on the rails, and it's actually a pretty interesting time to be involved in the hoby. Get the cameras out and keep 'em rolling, folks.